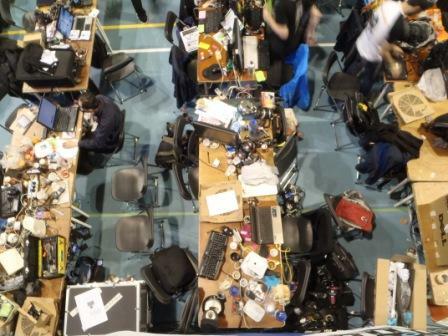 RoboCup 2013, the robot football world championship, is now over! 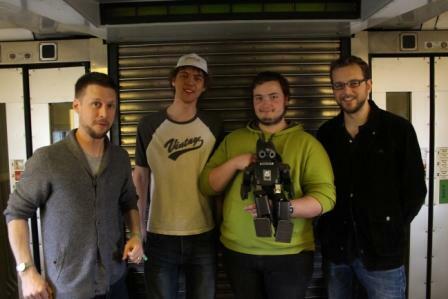 The University’s Bold Hearts team took part, not only in the 3D Humanoid Simulation League where we’ve competed before but, also for the first time in the in the Humanoid Kid-Sized Hardware League: real humanoid robots running after the ball - uncontrolled by humans and fully autonomous! In the Simulation League (where no hardware is used, we use software to control “virtual” robots in games which are shown on monitors) we’ve taken top spots in previous years with a strong third place trophy last year. And this year we were about to find out that the transition to the hardware league was not going to be easy! Typically, hardware teams in their first competitions have robots standing around, looking futilely for the ball and generally doing nothing. Not so the Bold Hearts! True to their name, the robots went boldly for the ball and kicked it towards the goals - scoring quite a few! A great success for our new hardware team but, not always in the opposition’s goal! Unfortunately, the rules were changed this year – the goal posts were the same colour each end, making them indistinguishable for the robots and meaning that we scored a few own goals! As in our last blog post, we lost 1-3 to MRL from Iran where we actually scored two goals (including one own goal! ), won 2-1 against BitBots from Hamburg, and finally lost 1-2 to SNOBots in extra-time. After being 1-1 at full-time (and again scoring both goals! 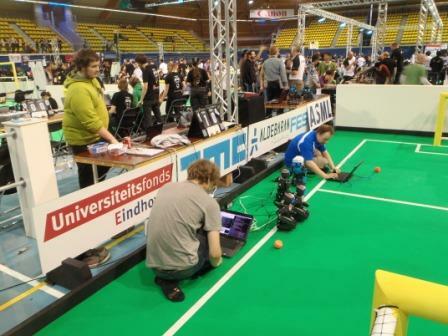 ), SNOBots scored thirty seconds from the end of extra-time – and we went out of the competition. But we were pleased with our efforts and were far from being a walkover. And we know that we can score goals which is good for the future. Our almost orphaned 3D Humanoid Simulation team, on the other hand, started well! It won the drop-in challenge (where robot players from different teams are combined and then evaluated how well they performed overall). Then, in the regular competition, disaster struck. Our team had massive communication problems and the player kept falling over - so our poor, neglected simulation team barely survived the first round. With extra input from our Kid-sized hard team who had completed their competition, we frantically tried to fix our simulation players – so that they could at least play at the level we expected them to. These efforts paid off as their performance in later rounds showed us how well they can play. We reached the last round before the finals – beating one of the favourites, magmaOffenburg 1-0 and drawing with FCPortugal (who finally came in 3rd place). Our Simulation team ended in fifth/sixth position out of a field of twenty-four - much better than we expected for an extremely tough competition and a simulation team that had to take the back seat to the hardware for months! Bold Hearts is looking forwards to next year's RoboCup in Brazil! !